We all have our secrets, and each secret is unique just like us. But there is one that many women, including myself, share. It’s a secret that makes me, in particular, squirm a little in shame on the inside. Especially as someone who prides herself on having quite a strict skin care routine. My secret is that...I sometimes sleep with my makeup on. I’ve always been a night owl who sleeps in the wee hours of the morning everyday, when it’s time for me to go to bed, I often just want to drop my head onto my pillow and pass out. So yes, there are times I’m simply too lazy exhausted to spend 10-15 minutes carrying out my entire skin care regime, which includes washing my face. Now I’m sure you’re probably wondering why I don’t use some common sense and buy some cleansing wipes, right? Don’t get me wrong, I’m never without makeup wipes around. But a lot of cleansing wipes I’ve tried in the past are either too expensive (for the amount you get), make my skin itch, or are just barely effective so I end up needing to use multiple sheets every time. You can see why I lose the motivation to grab some before I sleep. But that motivation has come back full force because one of my favorite skin care brands, Nivea, has recently released two varieties of cleansing wipes and I’m super excited to review the first one from the bunch which is their 3-in-1 Daily Deep Cleansing Exfoliating Wipes. 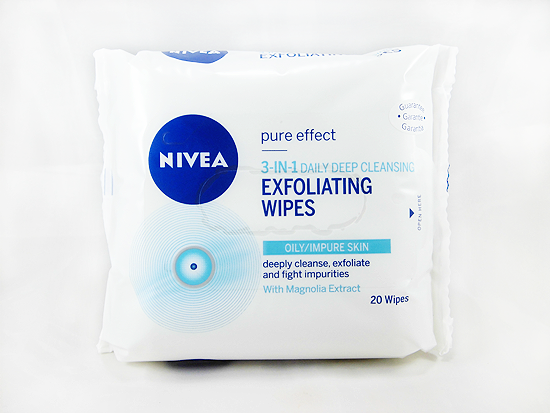 Nivea 3-in-1 Daily Deep Cleansing Exfoliating Wipes for pure and refined skin. The soft side deeply cleanses and removes make-up. The peeling side exfoliates dead skin cells & refines the skin – without leaving residues. A highly effective formula with Magnolia Extract helps prevent impurities – without irritating the skin. Result: Beautiful skin which is visibly pure and refined! Unlike the other variant, the Nivea Gentle Facial Cleansing Wipes, which is meant for dry and sensitive skin, this one is best suited for oily skin. Exfoliating skin is important for all skin types, but why does it seem that those with oily skin are encouraged to exfoliate more? That’s because oily skin usually has an extra thick layer of built-up dead skin cells, as well as a thicker pore lining. Exfoliating removes that build up and reduces the chances of your pores clogging, making skin feel smoother. The Exfoliating Wipes also have Magnolia extract, which contain anti-bacterial and anti-inflammatory properties that are essential for getting rid of impurities on the skin and preventing breakouts. Magnolia also has anti-oxidant properties that fight free radicals – those nasty things that cause collagen breakdown which makes our skin age faster! 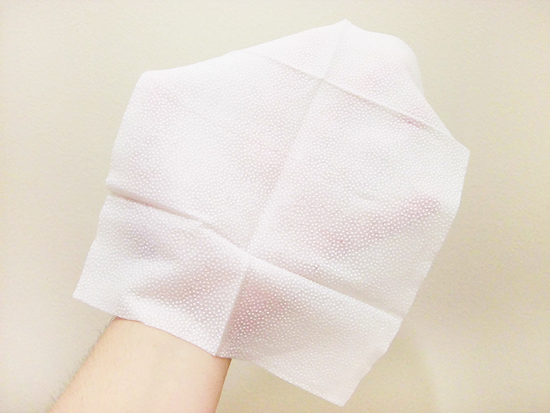 These are what the wipes look like. They’re quite big and that’s one of the things I love about it! I can’t stand using those tiny cleansing wipes. It’s like asking a someone to clean the floor with a toothbrush instead of a mop! Each pack, for both variants, comes with 20 wipes. The main feature of these wipes is that one side of it is textured. Those tiny bumps help to break down stubborn dirt and makeup, even the water-proof kind. It also means you can skip manually exfoliating because when you clean your face with these, the exfoliating job is already done! Since one side is smooth, that’s what I use first to get rid of the majority of my makeup. I freely wipe the smooth side over every inch of my face, then flip it over and use the textured side to pick up any remaining dirt and makeup, as well as to exfoliate my skin at the same time. 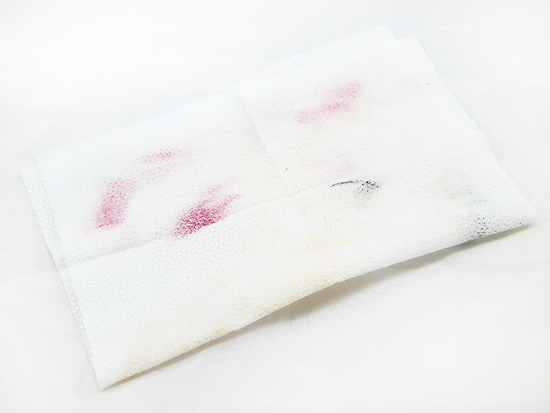 Depending on how much makeup I’ve had on, I use 1-2 wipes. I’ve never used more than 2 though, even after having had on full coverage and long-wearing makeup! Here are two pictures of one cleansing wipe which I used to remove the following: a medium-full coverage BB cream, light-medium coverage powder, blush, eyebrow pencil, water-proof liquid eyeliner, water-proof mascara, and lipstick. This is the kind of makeup I use everyday and the cleansing wipe was able to remove pretty much all of my makeup! I would say 99% of it was wiped clean. The only thing it had a little trouble removing was my eye makeup, but we all know how stubborn water-proof eye makeup can be. Pretty much only cleansing oils are able to break them down, and even that needs some time and patience. I’m not disappointed that the wipe wasn’t able to completely remove my eye makeup because I really do make sure to use a separate, oil-based cleanser for my eyes. 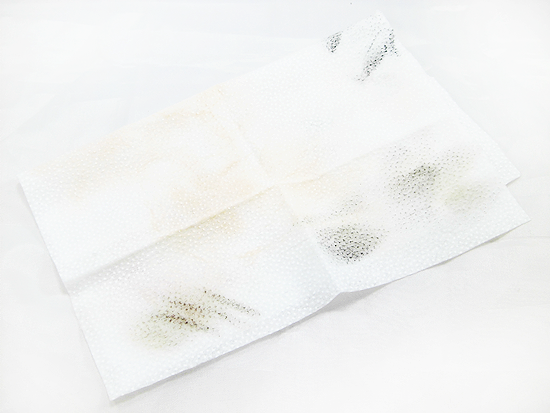 Even so, the wipe was able to remove some of the mascara and eyeliner which means removing it with a separate cleanser ends up being both easier and faster! 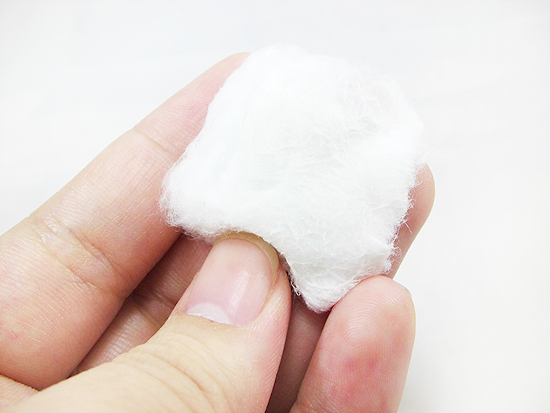 That’s right, the cotton ball still looks super clean, as if I didn’t just run it over a face that was covered in multiple layers of makeup right before. And I didn’t even wash my face yet! Overall I’m very much impressed with the Nivea 3-in-1 Daily Deep Cleansing Exfoliating Wipes. They get the job done by deep cleaning the skin, and can even save you time in your skin care routine by not only leaving you much less to wash off, but you don’t even need to exfoliate anymore after cleansing. With my dry-combo skin, these wipes also do well to buff smooth the dry areas of my face and get rid of dead cell build-up in the oilier areas. At less than PHP200 a pack, they’re easy on the wallet too. I actually keep and use both variants of the cleansing wipes, interchangeably of course. Because I tend to exfoliate in the mornings only, primarily to prep my skin for makeup, I reach for the Nivea Gentle Facial Cleansing Wipes most often when evening rolls around. For other times when I don’t get the chance or have the extra time to exfoliate, I go for the Exfoliating Wipes. As a result, I don’t end up over-exfoliating and I get super clean skin that’s ready for bed either way! Deep cleans the skin and removes 99% of dirt and makeup. 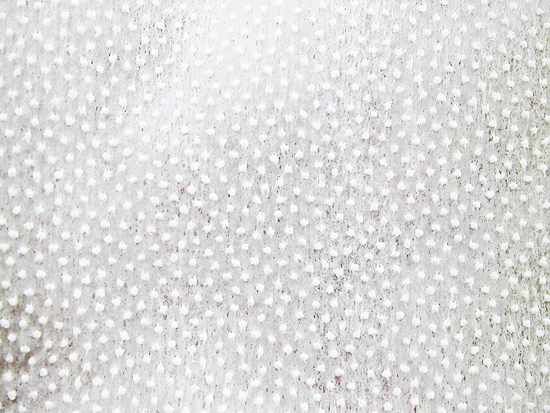 The textured side gently exfoliates skin and instantly makes it feel smoother. Doesn’t leave any residue on the skin. The wipes aren’t too thin and flimsy like with cheaper brands. Has a light, floral scent. Just something to take note for those of you who are particular when it comes to fragrances in beauty products. If you have sensitive skin that’s also oily, you can definitely still use this variant, just be extra gentle when wiping with the textured side and take care to not use the wipes everyday. I suggest having both variants like I do, and to only use the Exfoliating Wipes 1-3 times a week. Those of you with sensitive skin can much more easily end up aggravating the skin if you exfoliate too often and/or with too much force.